Welcome back! This month we take a trip to Pak Thong Chai in the northern-eastern province of Nakhon Ratchasima (Korat) about 300 km from Bangkok. 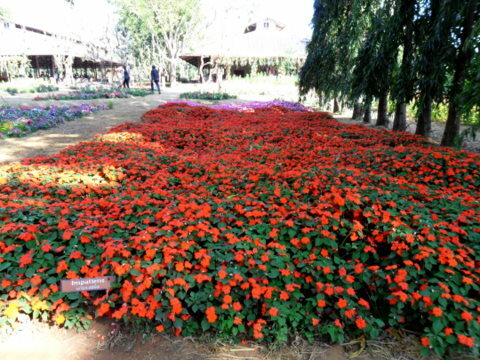 Nakhon Ratchasima province or Korat is about 300 km north-east of Bangkok. 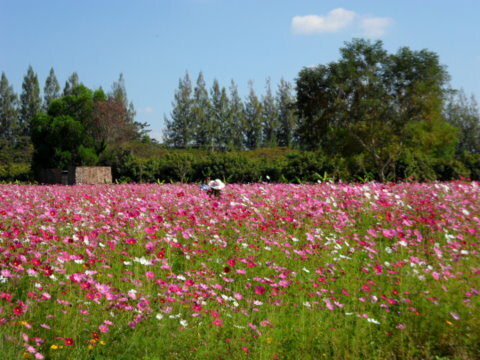 It’s located on the Korat plateau. The Mittraphap Highway or Highway 2, built by the Americans in the 1960s, passes through Korat and goes all the way to Nong Khai on the Laotian-Thai border. 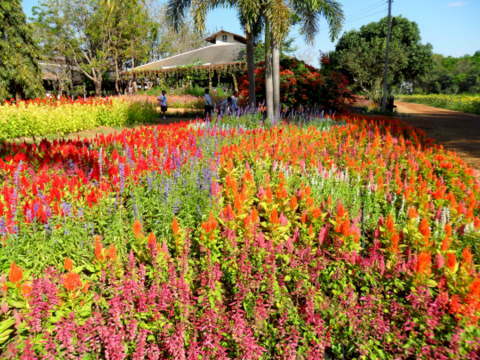 From Korat city the provincial capital, roads fan out to the various provinces in north-eastern Thailand or Isarn, making Korat the gateway to Isarn. 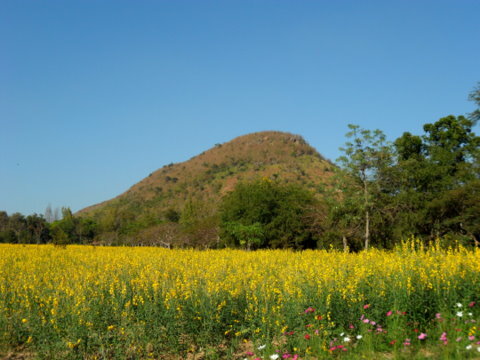 Pak Thong Chai is the name of a district and a town in Nakhon Ratchasima province. 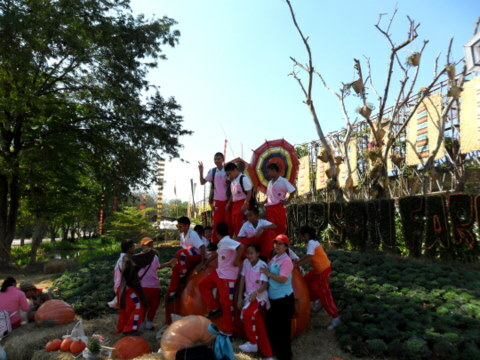 The town of Pak Thong Chai is about 25 km of Korat city. Please see the map of Nakhon Ratchasima province. 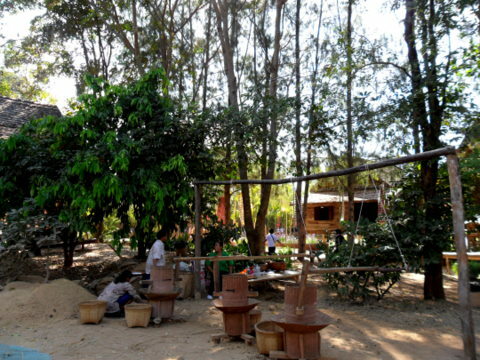 Pak Thong Chai has a long tradition of mulberry tree cultivation, silk worm rearing and silk weaving. It was because of this tradition that an American visited the area in the 1950s and left his legacy there. Jim Thompson, an American from Delaware, served with the OSS (Office of Strategic Services, forerunner of the CIA) during World War II. In mid-August 1945 he was due to parachute into north-eastern Thailand to link up with the leader of Seri Thai (Free Thai), the underground anti-Japanese resistance. Hiroshima and Nagasaki put an abrupt end to the war and Thompson had a relatively comfortable landing in Don Mueang instead. After the war, he left Bangkok and returned in 1947. 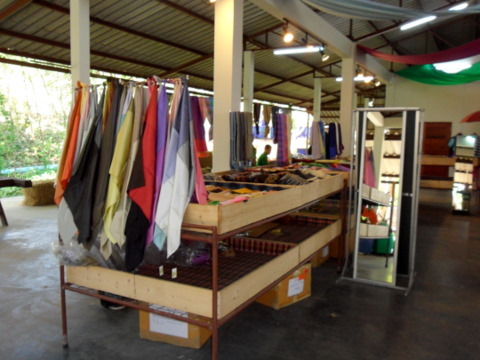 A year later he started the Thai Silk Company which gained international acclaim in the years to come. In early 1967, Jim Thompson decided to spend Easter in the Cameron Highlands, Malaysia. During a walk in one of the jungle trails on Easter Sunday afternoon 26 March, he disappeared without a trace. His disappearance remains an unexplained mystery to this day. But the Jim Thompson legacy remains. Today there are 13 Jim Thompson retail shops and one factory outlet in Bangkok, 14 retail shops and one factory outlet in the rest of Thailand with a retail shop each in Germany, Malaysia, Singapore and the USA. There are also showrooms and distributors in major cities in every continent. In addition, the cuisine of the Jim Thompson Restaurant & Bar is available in Bangkok, Kuala Lumpur, Singapore and Tokyo. 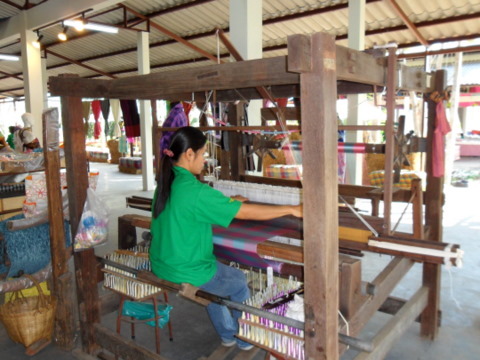 Most customers of Jim Thompson are exposed to the exquisite displays of Thai silk in the silk stores. Few know of or have visited the place where the silk comes from and where it is woven. 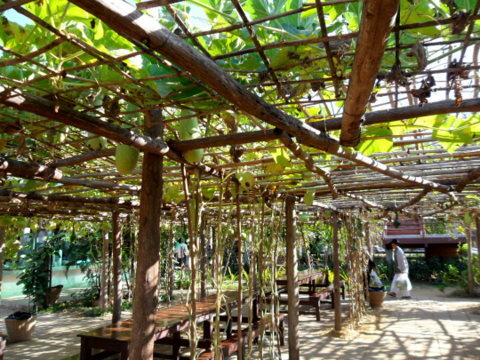 That’s where we are going next, Pak Thong Chai in Korat. 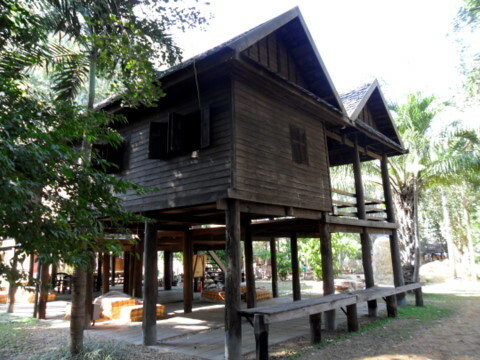 In the 1950s, Jim Thompson visited Pak Thong Chai and found a community of silk weavers. 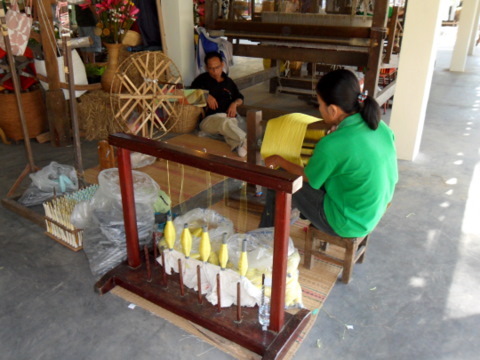 These weavers together with another community in Bangkok provided the silk for Thompson’s silk stores. Later in 1988, the company started its own mulberry plantation and silk worm production in Pak Thong Chai to ensure a reliable and high quality supply. 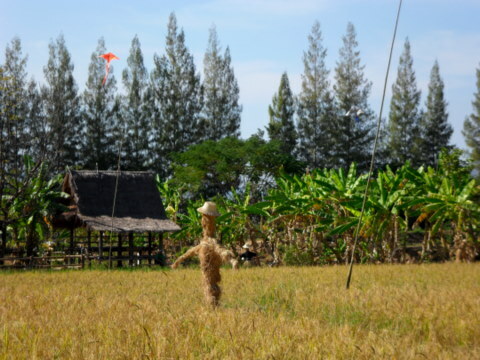 This area of 96 hectares or 240 acres was the start of the Jim Thompson Farm. 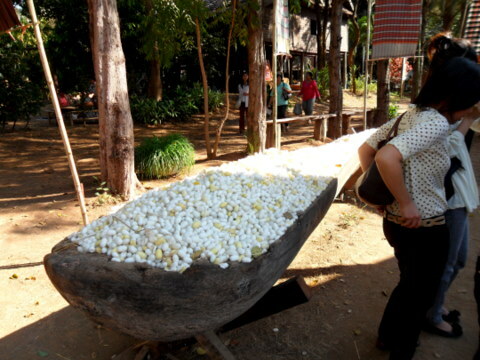 The cocoons produced were sold to the farmers who could either resell them in the market or reel the silk to be resold to the Jim Thompson factory for weaving. 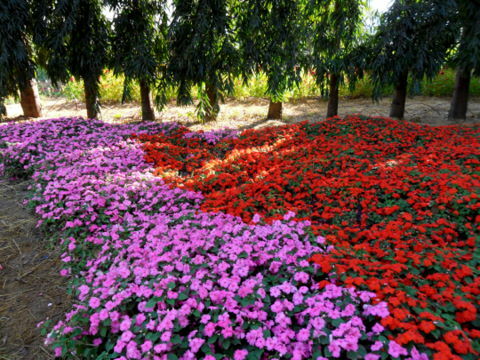 The farm was later expanded to include nurseries, orchards, gardens and hydroponic cultivation in an area covering 112 hectares or 280 acres. 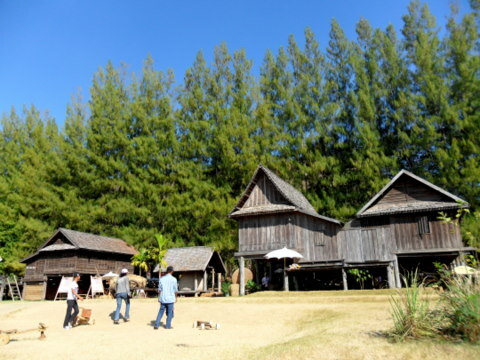 In 2001, the Jim Thompson Farm opened its doors to visitors during the cool season in December/January period of each year. 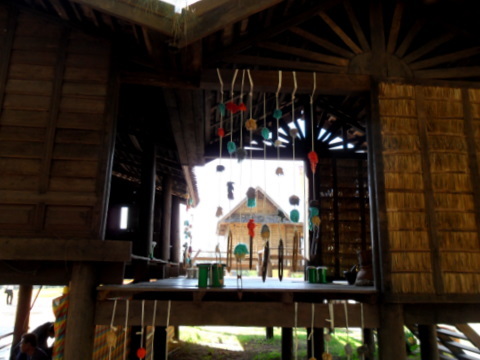 I found out about this only in December 2010 and decided to visit Pak Thong Chai on 5 January 2011. Here’s a pictorial account of that tour. The place is a great favourite with the children. Take a look at the pictorial map of the farm to give you an overall idea of the tour route. A tour bus runs along this route continuously. Visitors can alight at any station, admire the sights and board the next bus that comes along. Keep on doing so until you get back to the start point at the entrance. You can grab a quick meal here before you start the tour or after you have finished. 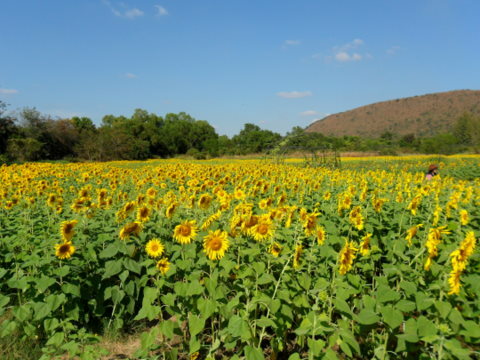 There are vast fields of sunflower and other flowers in the farm. 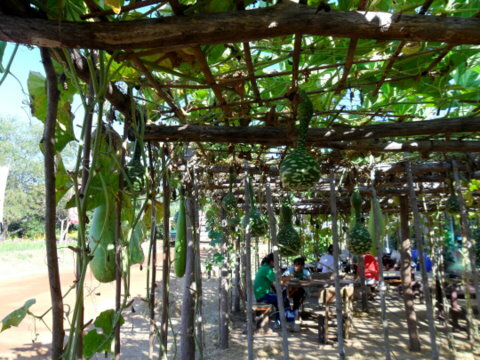 When he was studying silk worm cultivation and the silk weaving process, Jim Thompson toured north-eastern Thailand and the areas bordering Laos. He also had Laotian friends who were advising him on silk production. For this reason, he developed an affection and close attachment to the north-easterners and Laotians who were ethnically and linguistically akin. 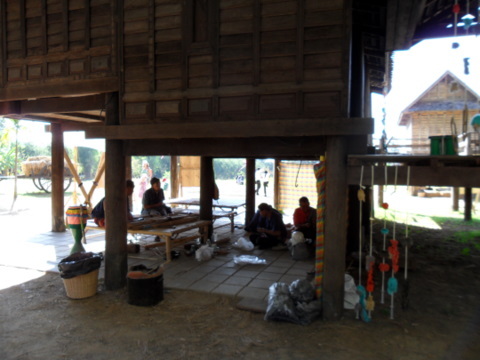 This model Isarn village complete with villagers and scenes depicting village life is testimony to that. 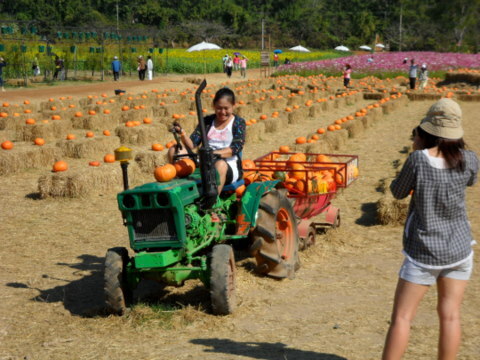 Get a feel of village life from the activities around the village. 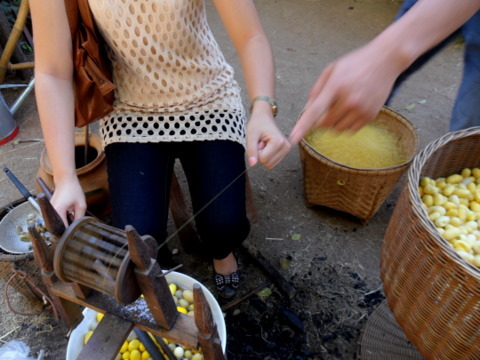 At this village, visitors can also try their hand at reeling the silk yarn from the cocoons. A silk necktie requires yarn from 120 cocoons! 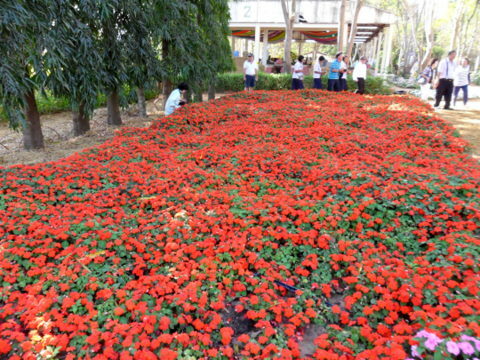 The colourful flowers at the Jim Thompson Garden would make beautiful souvenir photos. Observe at close-quarters how the silk is woven. 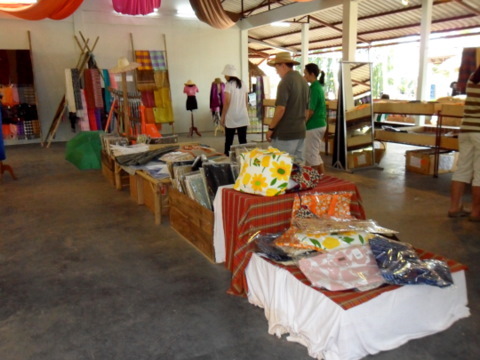 You can buy these beautiful Thai silk products at the local market here. Fresh and processed fruits and cut flowers are on sale too. 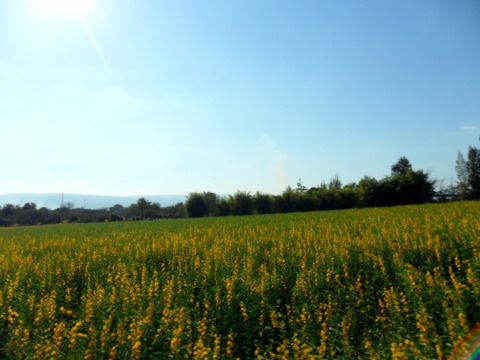 This was the first scene I encountered when I entered the farm, a sunflower field with a hill in the background. I took a last lingering look at the scene before I left. Four decades after Jim Thompson’s disappearance, the company he left behind has embarked on an undertaking that he would whole-heartedly support; a project dedicated to preserving and promoting Thai arts and craft, the Isarn architecture, culture and way of life, the very things close to his heart. 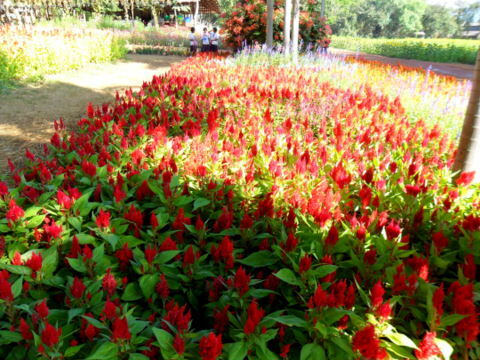 The Jim Thompson Farm is open to the public only during the cool season in December/January every year. 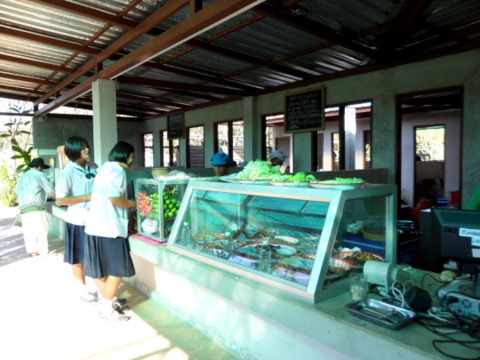 In 2010/11, the farm opened from 18 December 2010 – 9 January 2011. Opening hours are from 0900 – 1700 hours. 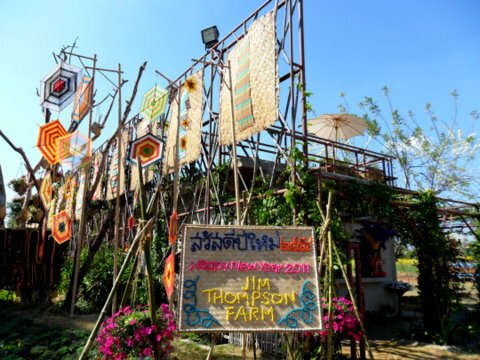 In addition in 2011, the farm also started the Jim Thompson Farm Weekend from 15 January – 13 February 2011 during which the farm is open every Saturday and Sunday. Opening hours remain the same, 0900 – 1700 hours. I’m not sure if they will continue with this in the following years. 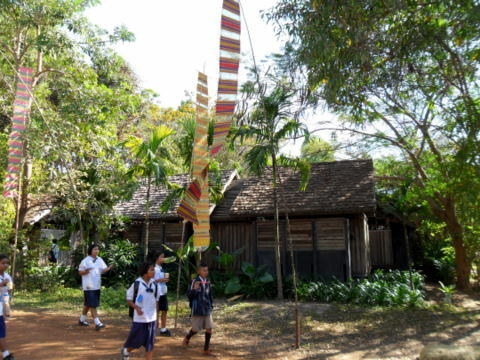 Admission fees are 80 baht for adults and 50 baht for children. Refreshingly, it’s a common price for ALL nationalities. Go to the Victory Monument and take a mini-bus to Pak Thong Chai (fare 190 baht). I made a mistake and took the bus that went by the southern route past Nakhon Nayok and Wang Nam Kheow. It’s a long and winding route with several stops. The journey took almost four and a half hours. I dropped at the junction leading to Takhob sub-district to take a provincial bus to the farm 20 km away (fare flat rate of 20 baht). The senior gentleman driving the provincial bus was kind enough to take me all the way to the entrance of the farm about a km away from the main road. You should take the mini-bus that goes along Highway 2 past Pak Chong en route to Korat then turn right to Highway 25 to Pak Thong Chai (fare 180 baht). It’s much faster. 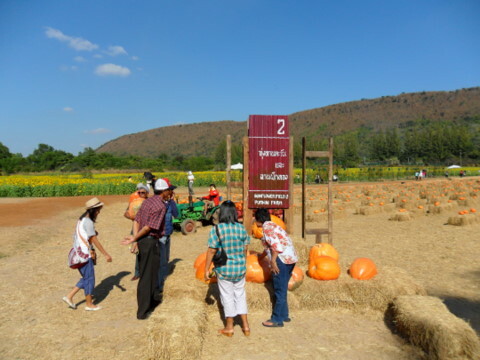 From Pak Thong Chai take a provincial bus to the farm. 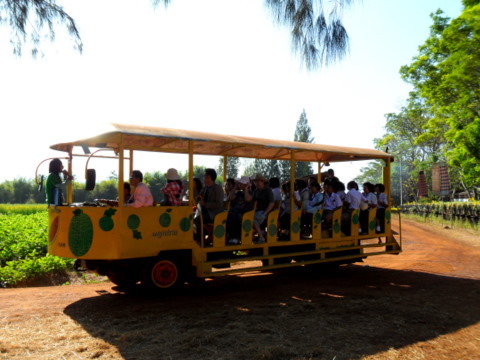 The last provincial bus from the farm back to Pak Thong Chai is at 1630 hours. Make sure you are on it. It’s 25 km to the nearest town. You wouldn’t want to be stranded here. There are no bus stops, just wait at the junction for the passing bus. Tell the driver you want to go to the mini-bus station to Bangkok. My bus driver dropped me off right at the station. Last mini-bus back to Bangkok is at 1800 hours (fare 180 baht). It’s far easier if you drive there. 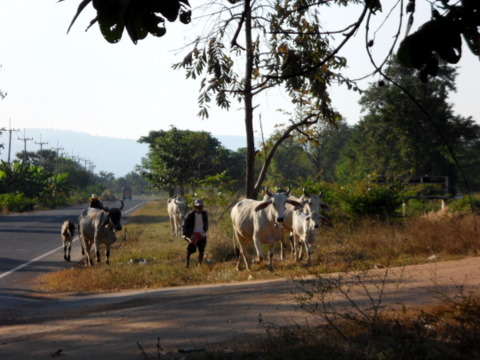 Take Highway 2 from Bangkok past Pak Chong on the route to Korat. Just before Korat, turn right to Highway 24 to Pak Thong Chai. When you get to Pak Thong Chai drive south along Highway 304 and look for the first four track traffic junction. Turn right to the road that leads to Takhob sub-district. 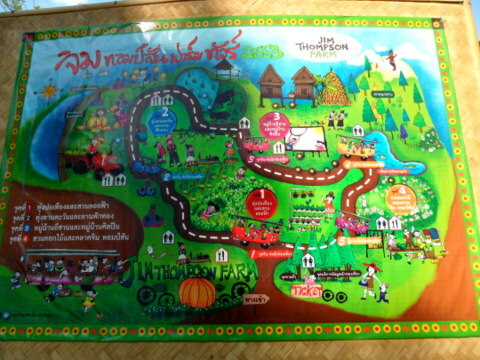 The route leading to the farm is well marked with signs of the Jim Thompson Farm. Highway 2072 further south also leads to the farm. The journey should take about three a half to four hours depending traffic conditions. Here are the related links to web pages on the subject of Jim Thompson and his legacy.